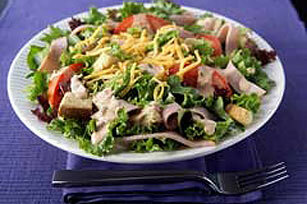 Find this easy Chef Salad to prove that food that's fast can also be a good-for-you choice! This chef salad is big enough to serve four. Prepare using KRAFT Lite CATALINA Dressing. Assemble salad on a large platter instead of on the 4 smaller plates.